The first thing to note is that almost no one apart from a few oddballs (e.g., Simon Thorpe, Mike Page, and myself) are strongly arguing that the grandmother cell hypothesis should be taken seriously. Far from challenging “the long-standing assumption that single face cells encode individual faces”, the authors are defending the status-quo. But the more important point is that the Chang and Tsao paper provide no evidence against grandmother cells. The problem is that the authors have a basic misunderstanding of the hypothesis, and as a result, they have not carried out a relevant experiment. What was the key finding that the authors took to refute grandmother cells? 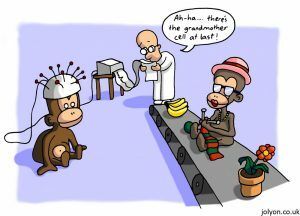 They failed to find any cells in monkey IT cortex that selectively responded to unfamiliar human faces. Instead, they found neurons that responded to single dimensions within a 50-dimensional “face space”, with a pattern of activation over ~ 200 of these neurons coding for these faces. That is, these faces were coded by distributed rather than grandmother cells. The observation that these neurons represent part of a face space is an interesting claim (but see below). But the important point for present purposes is that a grandmother cell theory is a theory about how we recognize *familiar* categories – people like your grandmother, not unfamiliar people. No theory (grandmother or otherwise) predicts that single cells in monkey brains should selectively respond to unfamiliar human faces. In the same way, no theory should expect to find neurons in human visual cortex that selectively responds to an unfamiliar monkey face. Indeed, when Quian Quiroga and colleagues were looking for highly-selective cells in the hippocampus of humans they deliberately presented participants with images of highly familiar people, objects, and scenes. “Before this work that is described in this paper itself… people thought at the highest levels of the brain’s face recognition system there are cells that are selective for specific individuals, all the people that you know and recognize there are cells encoding them. This does raise the question why they even bothered testing their version of grandmother theory given that it was ruled out a priori on the basis that there are not enough specialized neurons in a monkey brain. But there is an interesting alternative grandmother cell hypothesis that a few researchers do entertain, namely, the view that some neurons selectively represent familiar categories, things like familiar faces, words, and objects. On this view, single neurons respond most strongly to inputs from one specific category, although the neuron may respond to a lesser degree to inputs from similar categories. The category is identified when the neuron fires beyond some threshold. This requires considerably less than 6 billion grandmother cells devoted to faces. Nevertheless, critics of grandmother cells keep rejecting the straw-man version, and don’t seem to even appreciate that there is an alternative hypothesis that they should consider. Nevertheless, despite this exchange, Quian Quiroga (2017) claims that failing to find selective cells for unfamiliar human faces in the visual cortex of monkeys might finally put a rest to the grandmother cell hypothesis. I think there is one point we all can agree on, namely, there are no grandmother cells of the sort that Chang and Tsao (2017), Quian Quiroga (2017) and Plaut and McClelland (2010) are rejecting. They are correct: There really are not enough neurons in the human brain to code for all possible monkey and human faces, let alone all possible scenes, sentences, and thoughts, etc., using grandmother cells. The same goes for monkey brains. It is also a view that no one ever held. At the same time, it is important not reject a serious hypothesis based on the Chang and Tsao study, namely, the view that some neurons selectively represent *familiar* categories. This version of grandmother cells may also turn out be wrong, but few people even consider this hypothesis because they think rejecting an absurd theory of a grandmother cell rules out all versions. In fact, there is an abundance of neuroscientific and computational evidence published in high-profile journals that highlight the biological plausibility and computational advantages of grandmother cells for coding familiar categories. Indeed, grandmother cells have are learned in artificial PDP and deep neural networks, and these findings may help provide an explanation as to why some neurons in cortex respond in such highly-selective manner (for review see my recent TICS paper; Bowers, 2017). It would be great if researchers who reject grandmother cells would address these points. To get a range of perspectives on this issue, I would suggest having a look at the special issue of the journal Language, Cognition, and Neuroscience, 2017, issue 32, entitled “Cognitive and neurophysiological evidence for and against localist ‘grandmother cell’ representations”. Variations in the firing rate of face-selective neurons to images of different individual faces has long been reported in the monkey infero-temporal (IT) cortex, with population coding proposed as a mechanism for the recognition of individual faces (Baylis et al., 1985; Rolls, 1992). Hence, the alternative account that a single neuron fires for a single face (a “grandmother cell”) is a straw man, which has never been seriously considered by this scientific community. Again, I think these authors should also take more seriously the biological and computational arguments that have been put forward in support of grandmother cells. For example, although Rossion and Taubert (2017) cite Rolls in support of population (distributed) coding, Page (2017) details how Roll’s conclusions are unjustified, and indeed, Page shows that some of Roll’s key findings are predicted on a grandmother cell theory. Rather than focusing on grandmother cells, Rossion and Taubert (2017) question another core claim of Chang and Tsao paper, namely, that neurons represent human faces within a 50-dimensional “face space”. The problem they highlight is that successful pattern decoding of stimuli with a linear classifier might be observed even when the units sampled are not important for the presumed function. I agree. Some references related to this topic. Jeff, I just don’t understand your use of the term “category” here: for example, you say “ *familiar* categories – people like your grandmother”. “Your grandmother” is not a category. A category is a class of things: all grandmothers, for example. Your grandmother is not a class of things; it is a single thing. Hi Max, thanks for being the first person to post on my new blog! I don’t agree with your claim regarding categories. My grandmother is a category for me. When looking through family photos, my visual system will successfully recognize her despite the variation in the images. On a grandmother cell hypothesis, I do this by activating cells that are selective to images of my grandmother. Of course, you do not have this category (she is unfamiliar to you), so there are no cells in your brain that selectively respond to her. That is why the Chang and Tsao (2017) paper is conceptually flawed: Just as there are no neurons in your brain that selectively respond to photos of my grandmother, there are no neurons in the brain of a monkey that selectively respond to unfamiliar human faces. The relevant question is whether there are neurons in *my* brain that respond to photos of *my* grandmother because I recognize her. In my view, the same logic applies to different levels of categorization. On the grandmother cell hypothesis, my ability to categorize images of your grandmother as a person would reflect another set of neurons that selectively respond to human faces. If understand your paper, such a cell should be called a ‘gnostic unit’ rather than a grandmother cell because it is selective to a broader category (all people). I agree it is important to distinguish between subordinate and basic level categorization, and indeed, it is possible that grandmother cells support one type of categorization and distributed representations support another. But whether we should restrict the term ‘grandmother cells’ to subordinate level categorizations and ‘gnostic units’ to basic level categorizations is more of a terminological rather than substantive issue (if I’m understanding). I think it is simpler to use grandmother cells to refer to the hypothesis that categorization (at whatever level) are performed by selective neurons. It is also worth noting that neurons have been found that respond highly selectively at different levels of description. The early hand-detector neurons reported by Gross et al. may have been categorizing information at a basic level, whereas the Jennifer Aniston neuron identified by Quian Quiroga et al. may have been categorizing information at the subordinate level. I do realize that the Jennifer Aniston neuron was in the hippocampus rather than visual cortex, but single neurons may make subordinate categorizations visual cortex as well, at least when the categories are familiar – e.g., see Logothetis, J. Pauls, and T. Poggio, (1995), Current Biology, 5, p. 552–563.